Swift & Son, 43 University St., London W.C.
By rotating the binocular tubes as shown above and removing the Wenham prism from the optical path, the microscope can be used as a monocular. This binocular microscope was specially designed for both conventional and polarized light microscopy. The nosepiece has a Nicol prism mounted above the Wenham prism with each residing in a sliding brass box so that they can be introduced or removed from the light path. This arrangement can allow for simultaneous use of both prisms thereby resulting in a stereoscopic image using polarized light. 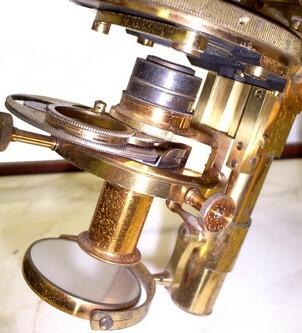 A specialize achromatic substage condenser, described below, was designed for this microscope. 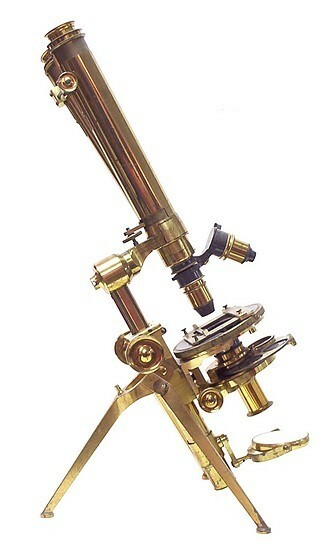 SWIFT & SON'S NEW PORTABLE COMPOUND MICROSCOPE. 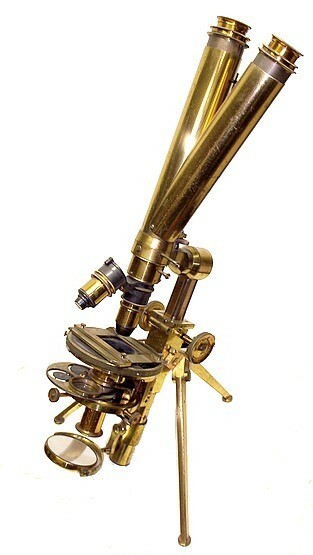 "This Microscope is so constructed that it can be readily set up for immediate use without the. Necessity of having to screw any part or parts together before using, a defect so often complained of in most portable microscopes. The whole of its joints and working parts are made to compensate for wear and tear, and when ready for use, as shown in fig. 1, is remarkably firm and steady under high magnifying power. It has sufficient coarse adjustment to work with the 5-inch objective. Lever fine adjustment with central lift. The stage is very large, and has an adjustable object-carrier, working upon glass bearings for smoothness of notion, whereby an object can readily be adjusted under a one-sixteenth objective. A ring is made to revolve in the centre of the stage by means of the small milled head, marked B, for the purpose of rotating a selenite film when the instrument is used for polarized light. There are flat and concave mirrors mounted on crank arm for oblique light. 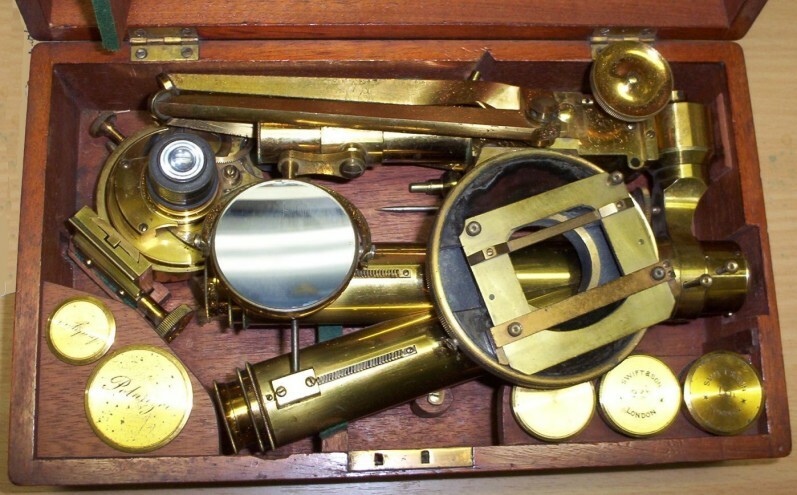 The optical tube of this instrument is of lull size, with long divided draw-tube. The whole folds up with eye-piece, as shown in fig, 2, and packs in a mahogany cabinet 9 inches long, 4 inches wide, mid 2 1/4 inches deep." In contrast to the catalog description above this example has a round rotating stage with a black glass surface on which the slide carrier moves. From the Swift catalog: "Swift's Adaptation of the Analysing Prism to the Binocular Microscope. The advantages of this adaptation, are effectual illumination in both bodies, and (the analyser being placed above the binocular prism) the transmission of a greater amount of light, and less distortion consequent upon the lessening of the distance between the objective and binocular prism"
A specialize achromatic substage condenser, described below, was designed for this microscope. B, rack adjustment for focussing. C, sliding frame with parts for dark ground illumination. E, rotating cap to carry test stops. F, small diaphragm of apertures. Swift's Portable Binocular. - Carrying still further an idea originally worked-out by Messrs. Powell and Lealand, Mr. Swift has devised a very complete Portable Binocular, which can be folded into a very small compass, without any screwing or unscrewing, and can be thus set up, as in Fig. 55 A, or packed away, as at Fig. 55 B, with great facility, when once the manner of doing so has been learned. Its construction is as marvel of ingenuity; while its workmanship is so excellent that its joints do not easily become loosened by wear, and can all be readily tightened when required. 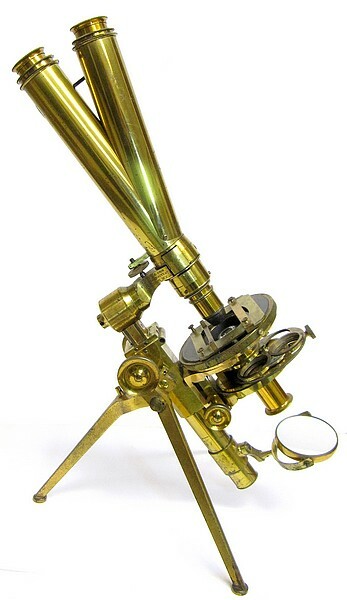 It is so-steady as to bear being worked (as a Monocular) with even high powers; but its great advantage consists in its suitability to the Traveler, who either wishes (as often happens to the Author) to display to scientific friends in other countries a set of objects that can be most advantageously seen by the Binocular under low powers, or to avail himself of opportunities of examining on the spot any interesting specimens he may meet with. The instrument also carries Mr. Swift's Combination Sub-stage (Fig. 85), which can be packed, together with three Objectives, Side-Condenser, and several other Accessories, into a Case only 11 inches long, 6 1/2 inches wide, and 3 1/2 inches deep, the whole weighing only 7 1/2 Ibs.